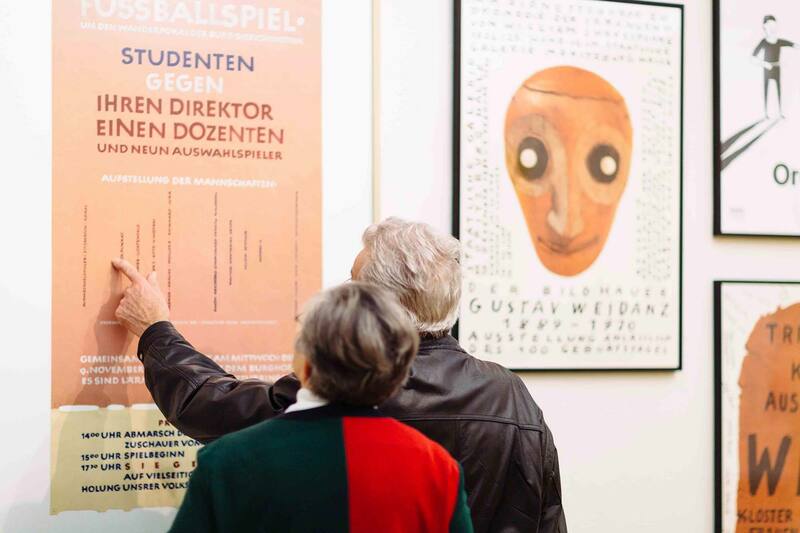 On January 14 the Burg Giebichenstein University of Art and Design in Halle/Saale launched its 100th anniversary with an exhibition that features over one hundred posters of its rich graphic design history. 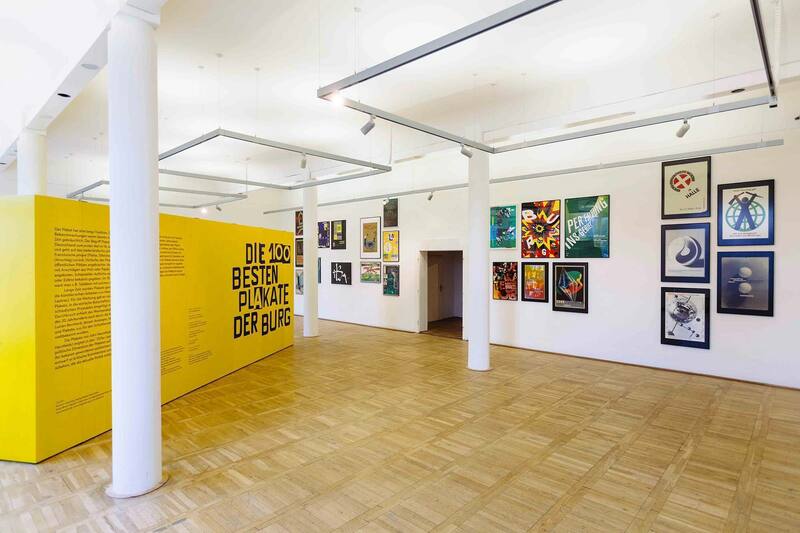 In an echo of the competition Die 100 besten Plakate des Jahres (this year’s 100 best posters), founded in the former German Democratic Republic in 1966, that continued in a reunified Germany in 1991 and that was extended to Austria and Switzerland another ten years later, Anna Berkenbusch, curator of the exhibition, formed an event that appropriately bears the name Die 100 besten Plakate der Burg (the Burg’s 100 best posters). 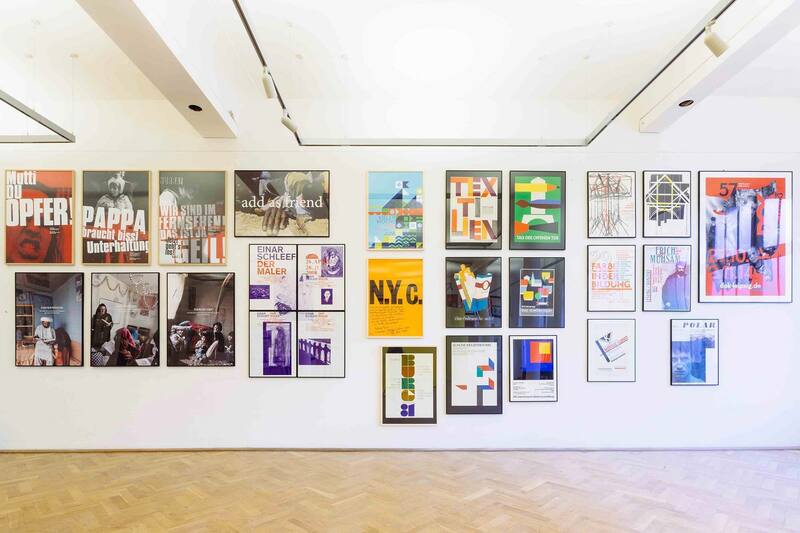 A seven-member jury appointed by Anna reviewed 687 posters from the university archives and 134 designs that had been submitted by current as well as former faculty and students in a competition last year. 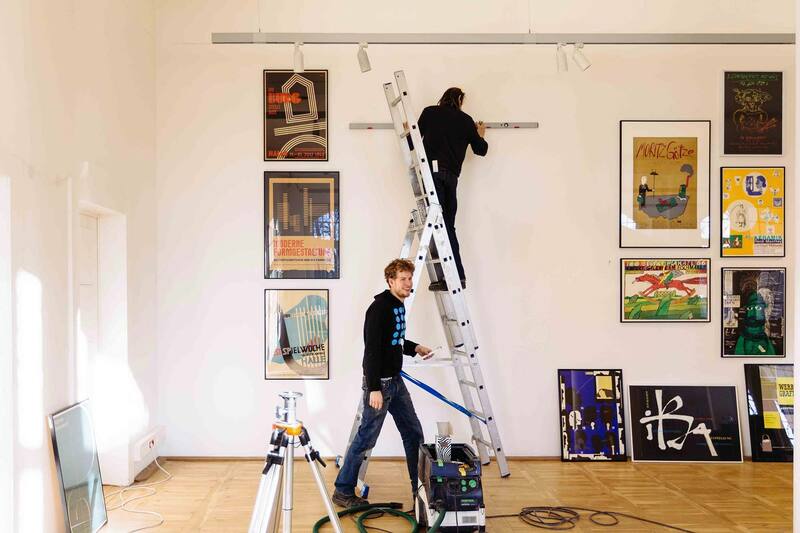 Ultimately over 100 posters were split up upon two large rooms at the Volkspark gallery space in Halle. In each of the rooms six meter wide walls divide the space create another axis and to work as a meta source for information. 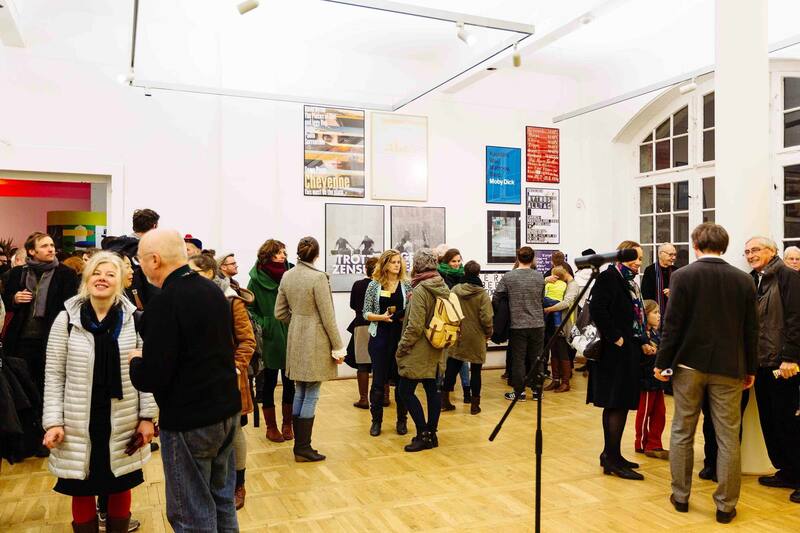 When panning an exhibition with one hundred posters one easily loses sight. Therefore miniatures of each posters were printed to come up with arrangements on the desktop. The judges were Berlin-based graphic designer Gesine Grotrian, the Austrian design consultant Clemens Schedler, Paris-based designer and educator Anette Lenz, art historian Dr. Sylke Wunderlich, Leipzig-based illustration professor Thomas Müller, museologist and editor René Grohnert and Bernard Stein, professor at the University of Art in Kassel. 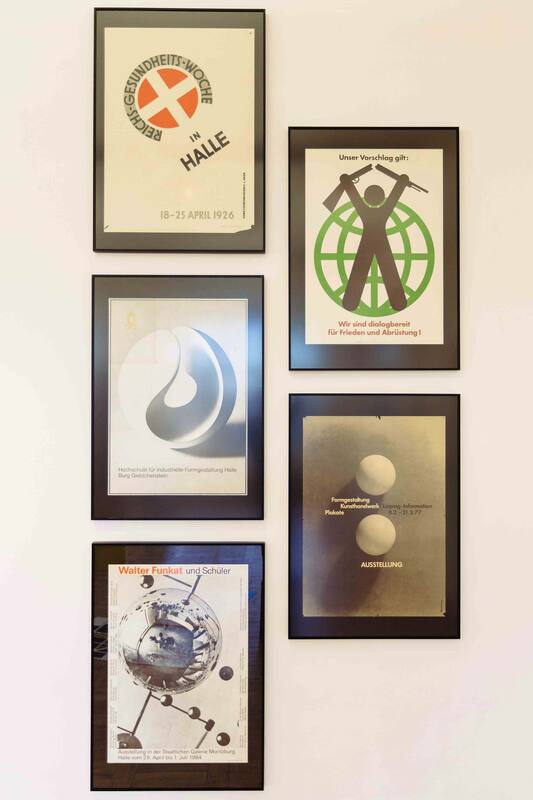 Any poster designed for the university or by teachers and students while they were affiliated to the institution was eligible for entry and within two days the experienced jury valued all 816 designs. 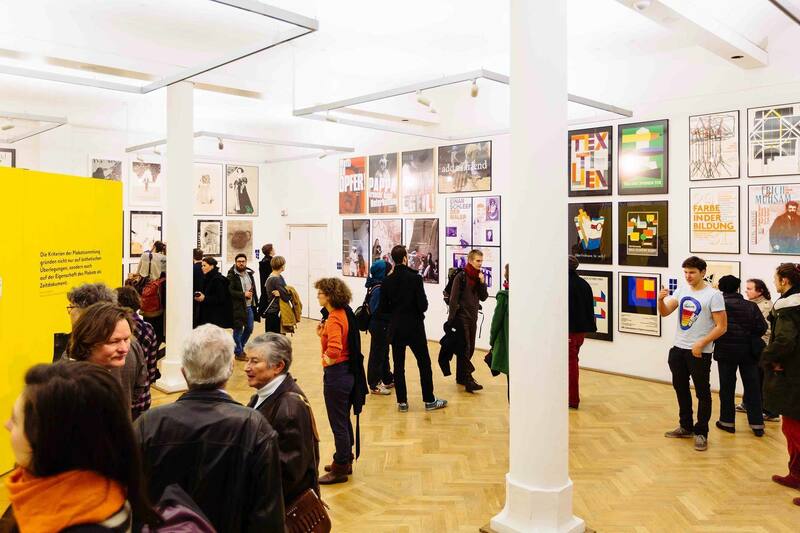 Ultimately the selected number of posters in the exhibition did exceed the idea of one hundred, simply because a series of three posters counts as one entry. Later on the arrangements where actually “laid out“ to put them to test in real-size scale and to make sure that there was enough room on the gallery walls. Mounting all framed posters to the wall was only possible with the many helping hands of the student body. 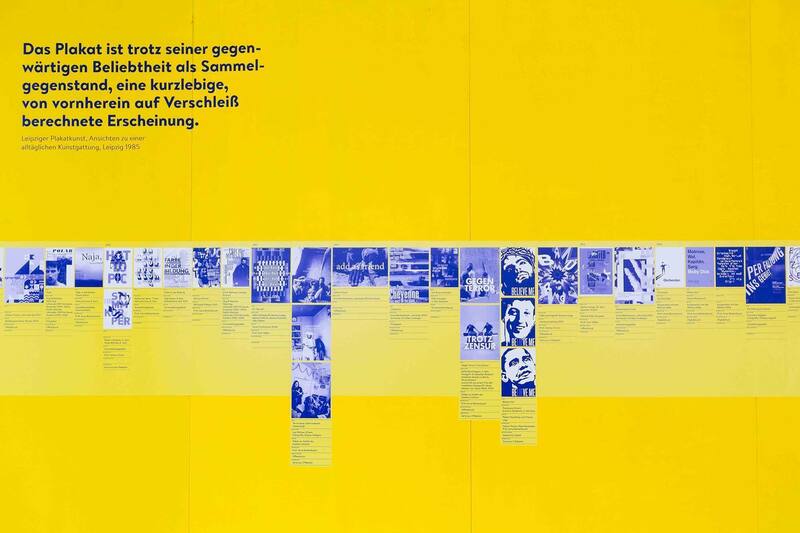 Instead of assembling the posters in chronological order or by designers, the arrangements were made according to form, color or visual effect. 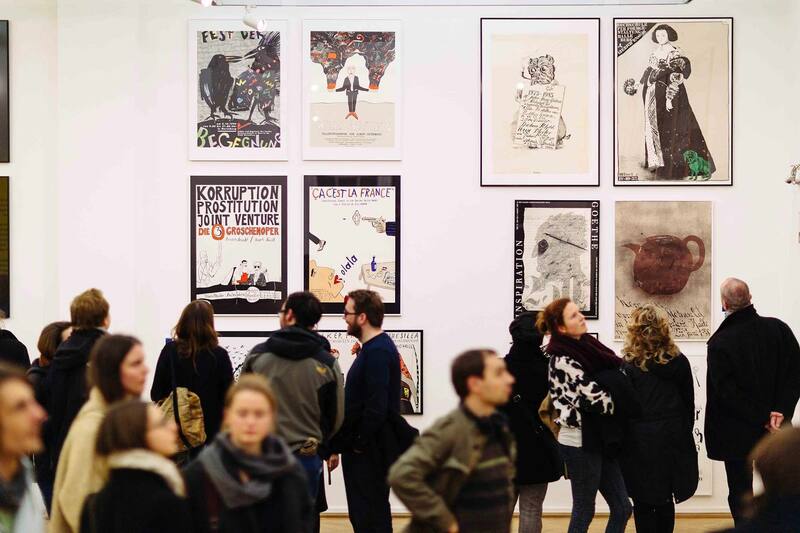 The exhibition concept enables new combinations of new and old posters. 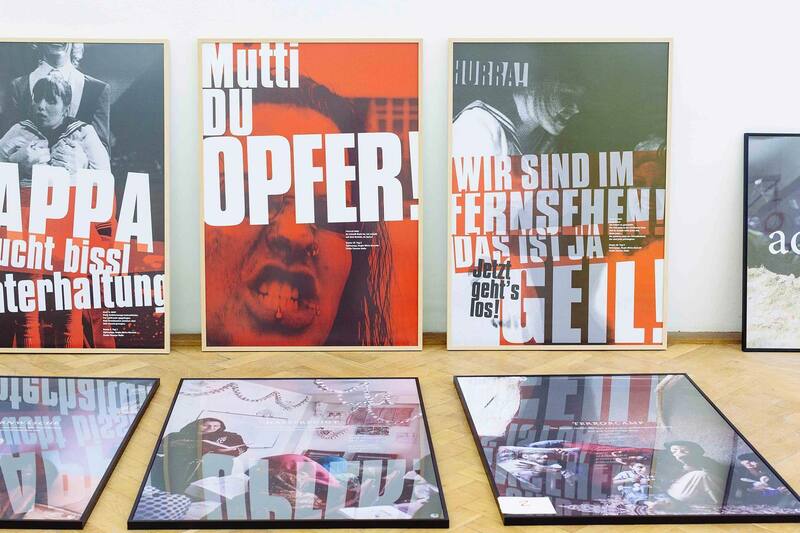 The one on the far right ist the jungest poster: an announcement designed for DOK Leipzig by Anja Kaiser in late 2014. 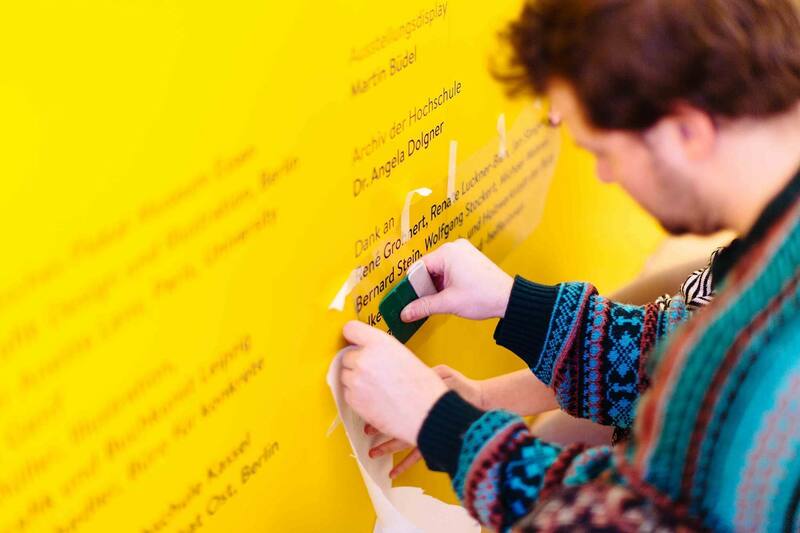 … and pasted on each of the walls. 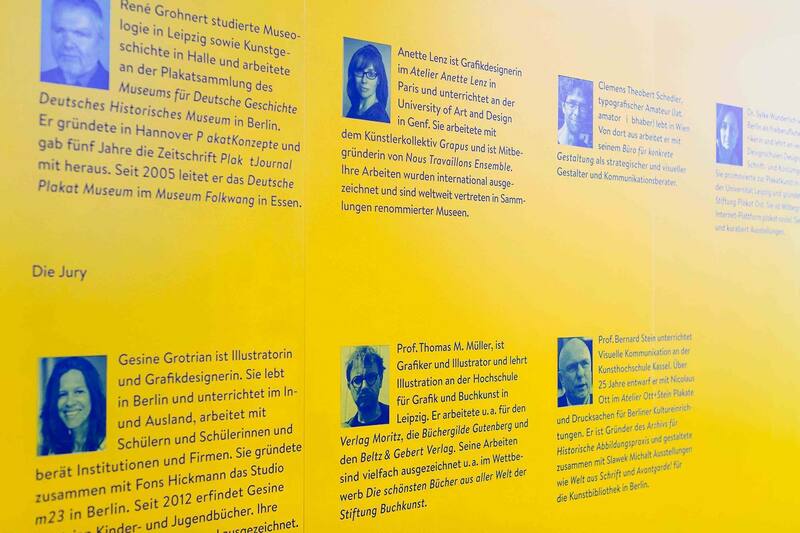 Designers who are well represented in the exhibition include Burg Giebichenstein legends such as Erwin Hahs, Walter Funkat, Gerhard Voigt and Helmut Brade. 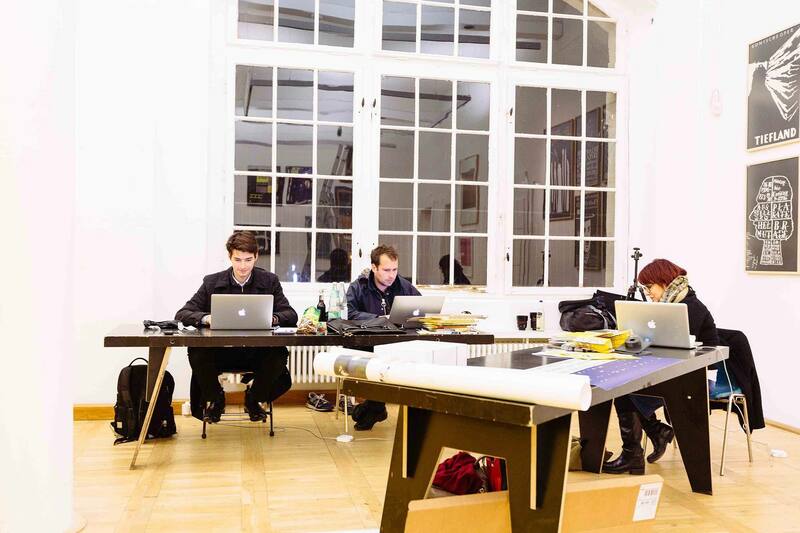 Works by rather recent faculty members include Berlin type designer Andrea Tinnes as well as the Leipzig-based design duo Hug & Eberlein. 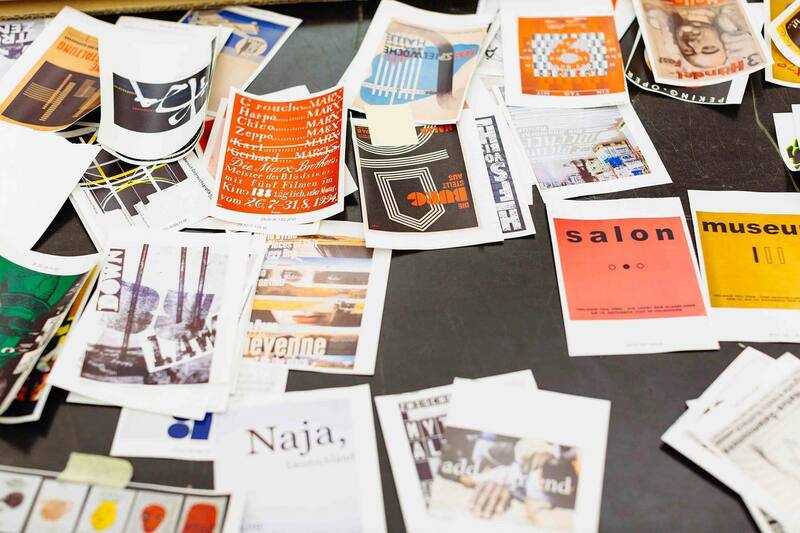 What’s more, a great number of student work is exhibited in the final selection. 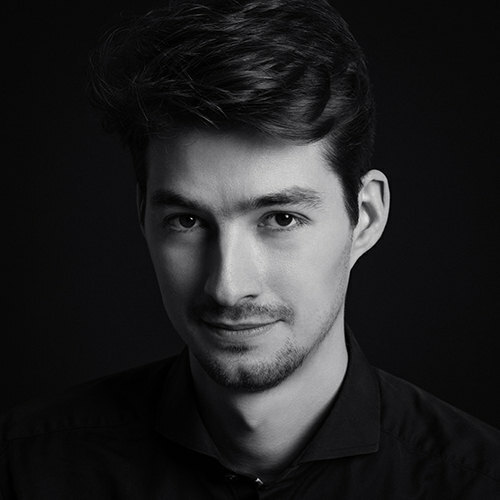 It is never easy to compare professional designs with that of students, but the jury made a point in displaying the whole scale of an academic institution in all its facets and styles. 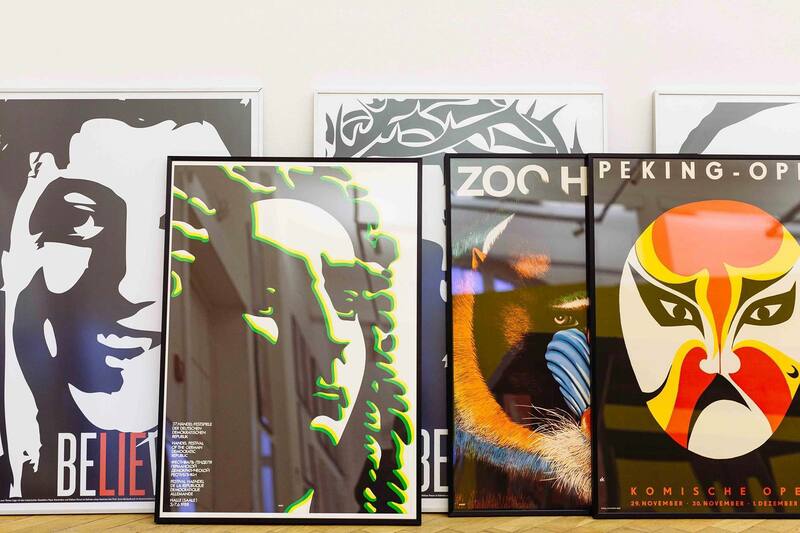 Some posters are rather reduced, designed in black and white and in simple forms, while others appear more colorful and in complex structures; in the end it is all about the idea. Development of a timeline to be mounted to one of the walls happened in between all the other work. 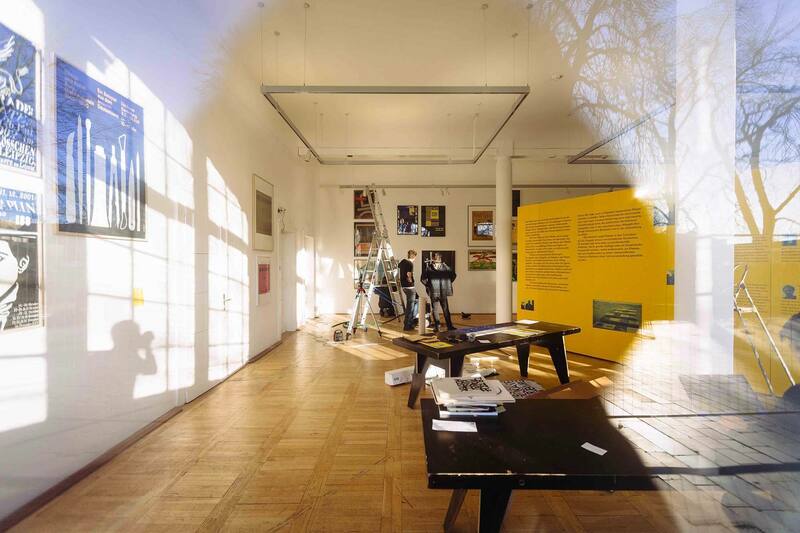 The timeline represents a participatory moment of the exhibition: not all information may be complete or accurate, thus gaps are left to be filled out by the visitors. Certainly much of the university’s history and developments in printing technology can be conducted from the posters and many of the names reveal interesting biographies. Funkat’s famous 1948 poster Die Burg stellt aus (the Burg exhibits) shows an early use of the university’s nick name “Burg” (engl. castle). 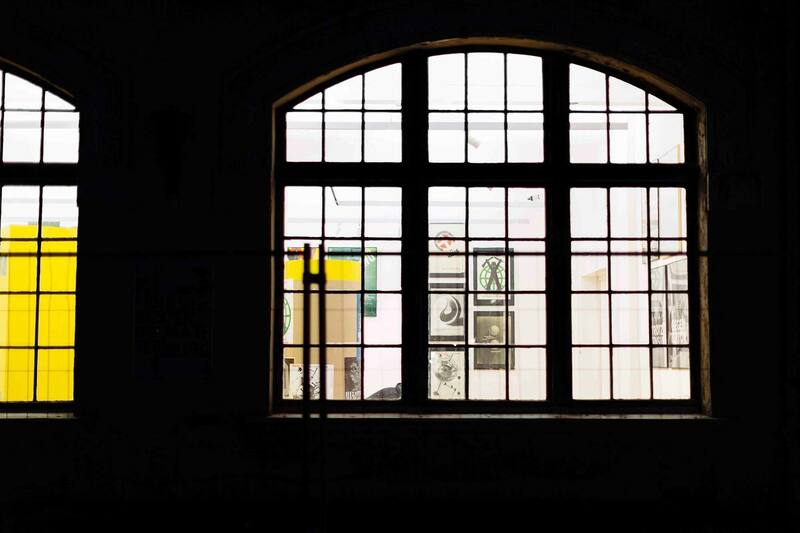 Hahs, who was discharged from the university twice (first in 1933 after the Nazis had declared his work “degenerated” and later, following his re-appointment after the war, by the socialist regime), designed two of the earliest posters in the exhibition. The release of one of Voigt’s infamous political posters was prevented in 1982 due to a clash of opinions. Years later, in 1988, the copy was changed and the poster went public after all. 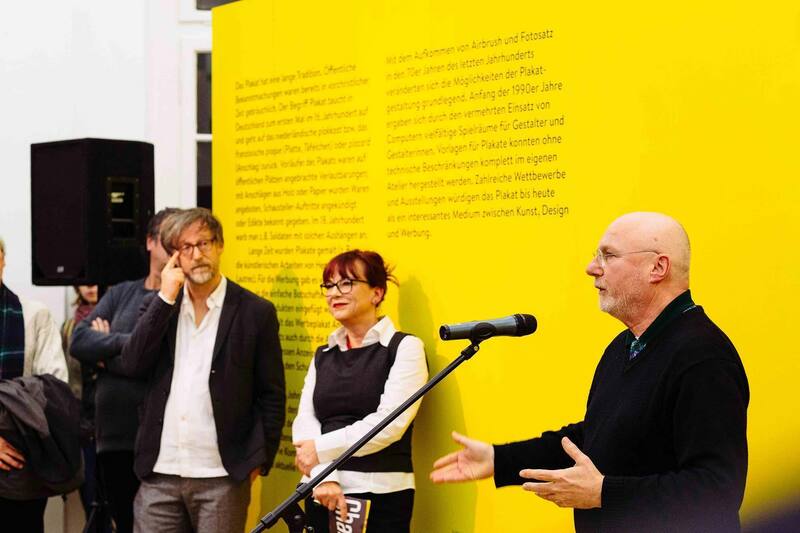 At the opening of the exhibition Dieter Hofmann, head of the design school, Anna Berkenbusch, curator of the show and jury-member Bernard Stein (f.l.t.r.) directed some words to the visitors. 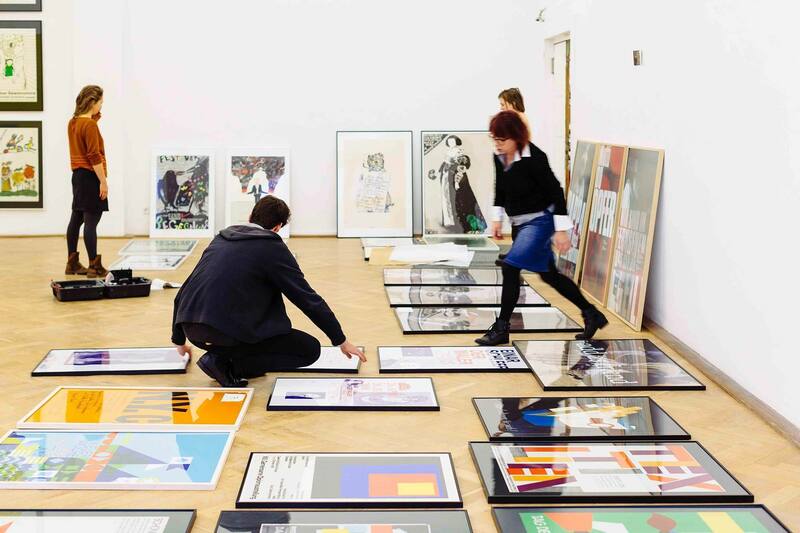 In the exhibition all posters are treated equally, there is no ranking within the selection. Instead of assembling the posters in chronological order, according to their content or by designers, they are arranged by form, color and visual effect, which results in exciting combinations of new and old: The oldest example in the exhibition is a wood cut poster by Johannes Niemeyer dated 1922, the latest is Anja Kaiser’s DOK Leipzig announcement, in an offset print from 2014. Overall the posters’ themes vary from a soccer tournament announcement (students vs. teachers) to messages preventing the city’s theatre closure and a call for the socialist two-year plan on May 1st 1949, to name but a few highlights. 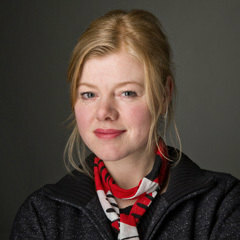 Andrea Tinnes, typography professor at Burg Giebichenstein, in a conversation with Bernard Stein. 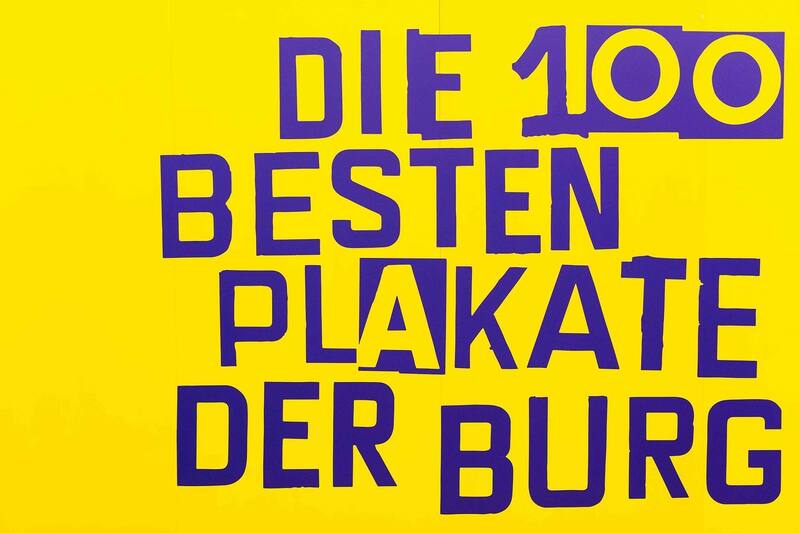 Die 100 besten Plakate der Burg is up until February 22, 2015. 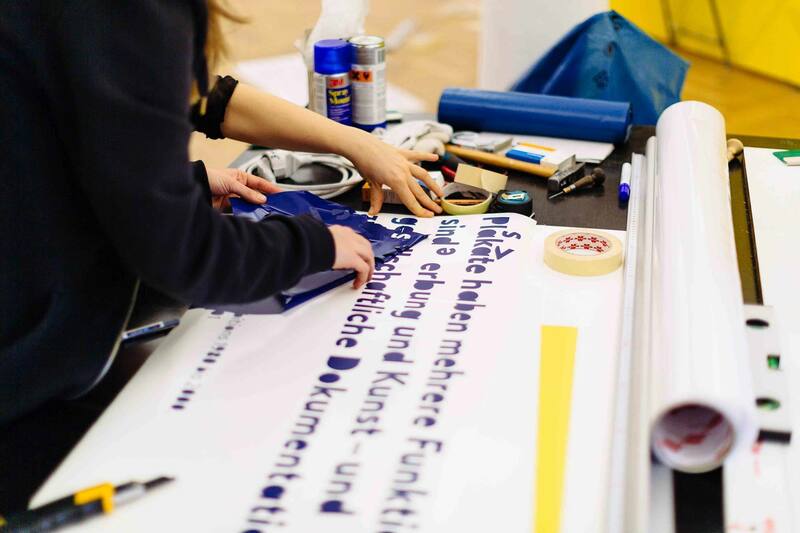 Other upcoming events are a lecture by jury member Dr. Sylke Wunderlich, Überklebt, Plakate in der DDR, on January 26 and a guided tour with a typographic focus on February 18. An exhibition catalogue has also been announced for summer 2015, just in time for the main festivities of Burg Giebichenstein’s 100th anniversary. 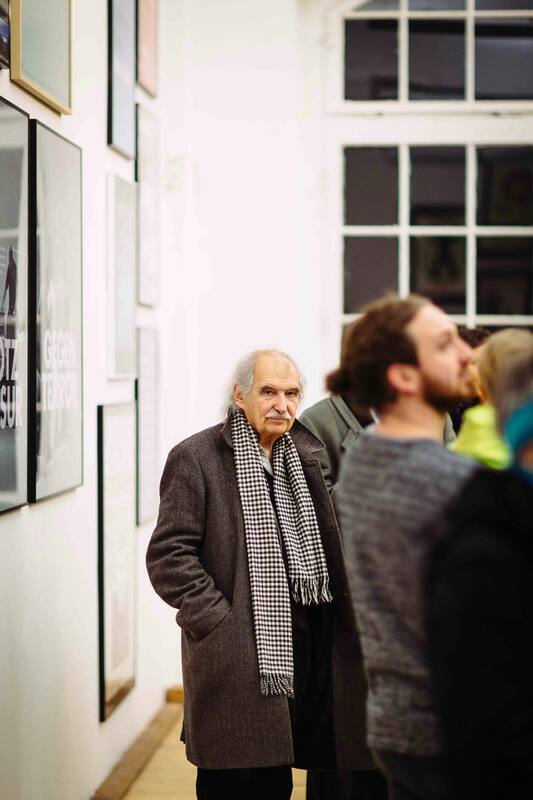 Burg Giebichenstein design legend Helmut Brade, who’s work is well-represented at the exhibition, was the special guest of the evening.